This is a recap of how I got myself a beautiful MicroVAX 3900 running OpenVMS 7.3 in an emulated SIMH environment on CentOS 7 Linux, connected over DECNET to the global HECNET (a Hobbyist DECNET), and over TCP/IP to the Internet. In this chapter, we will build the tools we need and test drive SIMH by bringing up a OpenVMS/VAX 7.1 MicroVAX 3900 system, purely as a walk-through exercise. We will discard this installation for the real OpenVMS/VAX 7.3 in the following chapters. I could not find tunctl for CentOS that we should have in our toolset, so I built it from the source. Create a user named openvms to run your VAXServer. Set a secure password. Add the user to the wheel group so that sudo is available for the user. Then logout of root and login to the openvms account you just created. We will build the VAXServer using this user all the way until the time we need special root privileges again for networking at a privileged port. Find, download and extract the latest version of SIMH. SIMH is being actively developed and the latest version is always available at github. The most current release is available as a zip file download. If everything worked, you should see something like this and the build was successful. Note that the build log below is from my Ubuntu 14 server and it includes the VDE (virtual distributed ethernet) as well tun/tap support because the corresponding libraries were installed. We now have a MicroVAX 3900 (the "vax" and "microvax3900" binaries are identical copies of the same simulator created by the make script), AND a VAX-11/780! If you are having difficulties building the SIMH VAX binaries, download a snapshot of my simh directory from google drive. I will use the "vax" binary simulator for the MicroVAX 3900 for the rest of this tutorial. Perhaps the procedure on the VAX 11/780 is similar; I do not know yet. Create a directory tree under your login directory to run your Vax in and copy over the binaries. At this point, we need a OpenVMS installation CD image to test our installation. To do a quick test, for now grab and un-compress the OpenVMS VAX 7.1 Operating System ISO from vaxhaven.com CD image archive. I have no idea of legality of the the distribution - it showed up on a simple google search for OpenVMS VAX ISO. Now we fire up the MicroVAX 3900 with the drives and the OpenVMS Installation CD ROM attached to it. Ignore the following network card related error for now; we will configure the network card later. You should see this below it. Now configuring HSC, RF, and MSCP-served devices . . .
Go ahead and install OpenVMS 7.1 just to test everything configured so far works, before we go to the next phase - obtaining OpenVMS Hobbyist Program membership and an official OpenVMS 7.3 operating system distribution along with numerous layered products for no cost licenses for hobbyists. Press Ctrl-E to get the SIMH prompt, then type in exit. Now run ./vax again and boot from the first hard disk (dua0) instead of the CD-ROM (dua3). 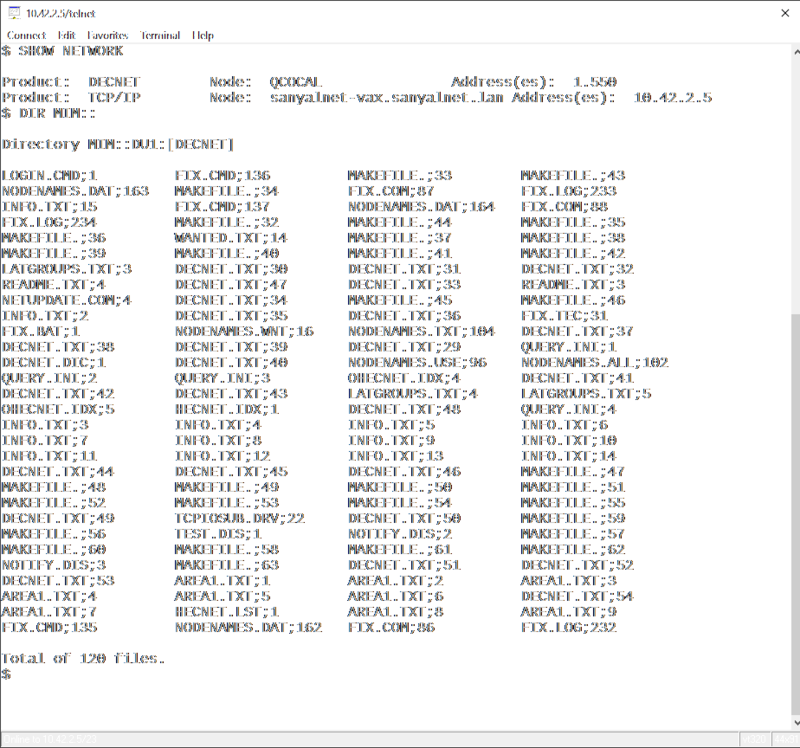 I have made the complete SIMH MicroVAX 3900 OpenVMS 7.1 installation snapshot available for download from my google drive. The download links are at the bottom of this post. You can go on to the next step, or play around a bit. Our basic SIMH installation works and tested out well; we will now have to obtain the OpenVMS 7.3 installatation ISO images and licenses from Hewlett Packard Enterprise (HPE), setup an ethernet tap, and connect to DECNET and the Internet. First, head over to the Connect Worldwide website and obtain a free individual membership. You will need your Connect Worldwide Customer ID for the next step. Once you have your Connect Worldwide Customer ID, visit the HPE OpenVMS Hobbyist Registration website to sign up as a hobbyist using your Connect Worldwide membership. A very friendly person from the OpenVMS Customer Lab (openvmscustomerlab at hpe dot com) will get in touch with you over email. You will be given access to a FTP server to grab the Hobbyist KITs including OpenVMS 7.3 operating system and layered products from. You will also be emailed some License PAK files that are super long and will cover everything you will possibly want to play with. Collect all the stuff from the FTP server and License PAK emails and keep them ready for use. The XQ Network emulator included with SIMH puts the network card into promiscuous mode, grabs all traffic and drops the traffic it does not need. What this means is if you configure your SIMH XQ ethernet card to use your real NIC, you will not be able to see your VAX from the host server. The popular solution to this, as mentioned in 0readme_ethernet.txt, is to create a TUN/TAP pseudo network interface tap0 for the host to create a TAP device for the simulator and then bridge or route packets between the TAP device and the real network interface. We have already installed the necessary tools at the beginning of chapter one. We will create a directory and deploy a shell script to set up the bridge and the tap for use by SIMH. Then reboot your CentOS server and when it comes back, log back in as root. Execute the ip addr command. You should see bridge br0 created bridging your physical NIC (ens33 in my case) having your original IP address, netmask and gateway as well as a tap interface tap0 created along with extra taps for use elsewhere. We are now ready to install our final OpenVMS VAX 7.3 Operating System on the SIMH MicroVAX 3900. Logout from the root account and log back in to the openvms account. # lsmod | egrep "tun|bridge"
Verify there is traffic on the bridge. Press Ctrl-C to exit from tshark. Once you have collected all the goodies from the Hobbyist program (which you did in Chapter 2), go ahead and install OpenVMS/VAX 7.3 using the VAXVMS 073 OS ISO disk included in the Hobbyist KIT. This comes in the file VAXVMS 073 OS ISO.zip that you have FTPd from a special Hobbyist-only FTP area access to which will be provided by the OpenVMS Customer Lab under the OpenVMS Hobbyist program. Press Ctrl-E to get to the SIMH prompt and type EXIT to exit the emulator. Now restart the emulator, and boot from the hard disk DUA0. Continue on and install OpenVMS, along with DECnet Plus and TCP/IP Services for OpenVMS which are also included on the CD image for OpenVMS VMS 7.3. Here is what I saw when I booted the first time from the hard disk DUA0 after restoring the image save set from the CD ROM. Here is an improved version of vax.ini that lives in the vax/bin directory along with the simh "vax" executable. This version of vax.ini causes the Vax to autoboot and exits the emulator when the Vax shuts down. The first time you run vax using this vax.ini, it will still ask for the boot device, but when you shut the Vax down the first time, it will remember the default boot device (DUA0) for the next time. As mentioned in the HECNET website, HECnet is a global DECnet that connects different people across the world who play around with different machines that have the DECnet protocol suite. Once you have DECnet Phase IV or DECnet Plus installed on your SIMH VAX, reach out to the contact person (currently Johnny Billquist <bqt at update dot uu dot se>) and ask for a area code and node number. Also download and compile the DECnet to IP bridge that you will need to connect to HECnet. Now you have the bridge program built. We need a configuration file. We can copy and edit the template Johnny included in the tarball.
! This is the bridge configuration file.
! is re-read on a SIGHUP.
! that appear on the local ethernet. If everything works, you should be able to see the public contents on MIM - a real-life and connect over DECnet to the hundreds of hobbyist systems - Vaxen, Alphaservers and PDP series computers - listed in MIM::NODENAMES.TXT (also on the internet here).